How we made it feel like a home. We moved into our home some years ago, long before it was completely finished. As time has permitted, we have tackled the process of finishing each room—one at a time. Our method was basically the same each time. Careful measurements were taken, the details of the “project” room completely designed, and then weeks of intense woodwork would begin. The meticulous handcrafting of each part and piece usually occurred after work each day, on weekends, or other days off from work. Often, months would go by until everything was ready. Then, we would drape plastic over the doorway to the room, and in a marathon weekend—sometimes longer—the walls were textured and painted, the prefinished woodwork applied, the floor coverings would go down, and finally, the new custom furniture carried into place. The front door is massive. At 4 feet wide, 10 feet tall, and 11 inches thick, it weighs in at around 3,000 pounds. The real challenge here was to carefully design and then machine all of the component pieces of this door unit in our shop. A temporary wall was constructed to the outside edge of the door surround so that we could have the adequate time and working room to assemble this monster. The individual pieces were then brought to the house and carefully assembled in position. We had previously constructed a steel skeleton and hinge system to carry the expected weight. An 8 foot long, 3 inch thick steel shaft through 4 pillow block bearings serve as hinge. (By the way, a 4 year old child can open the door with ease!) The massive lock mechanism was also hand made for this door. 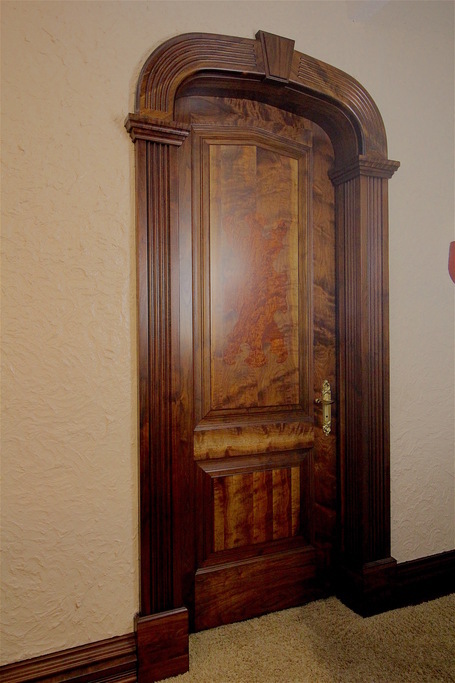 The exterior of this door unit is black walnut and the interior is Bois d’Arc. 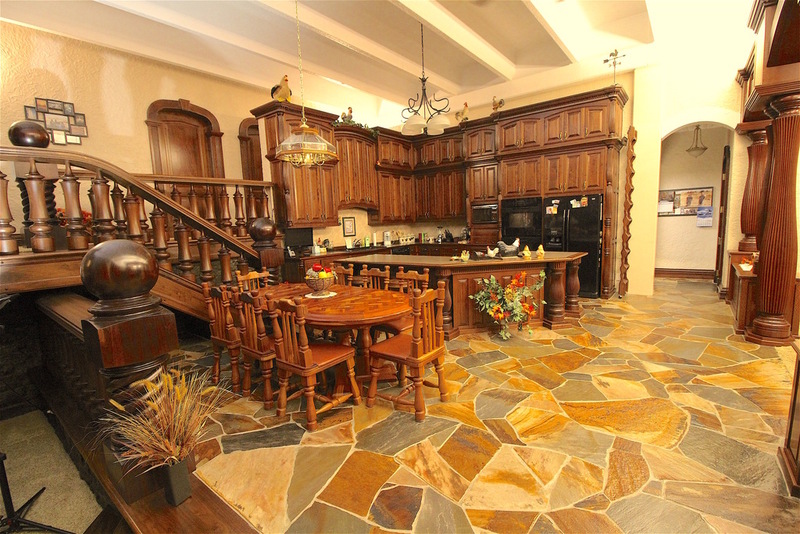 We have collected exotic woods for years with specific areas of our home in mind. This Bois d’Arc was cut well over 100 years ago and had remained in storage for all of those many years unused. We stumbled upon it quite by accident and purchased it from its second owner! Door handles of the size we needed are basically non-existent. So we hand carved a set of mahogany wood patterns for the interior and exterior door pulls and handles and took them to a local business that casts aluminum light fixtures. The result was a perfect duplication of our idea in aluminum. A little special paint, and we had our hardware. The door lock from the outside is a keyless RF system, much like an automobile locking system. For security, we will place a small pinhole video camera in the outside face of the door. The inside of the door is hollow and large enough for a small video screen—all accessed by a special door panel on the inside face of the door. Echo in an all-concrete building can be atrocious. We chose to put a reasonably heavy texture on all wall and ceiling surfaces. The cement block walls are coated with a finish coat stucco material, sealed with block filler and painted. The ceilings are exposed double-T pre-stressed beams, hand textured and painted bright white. 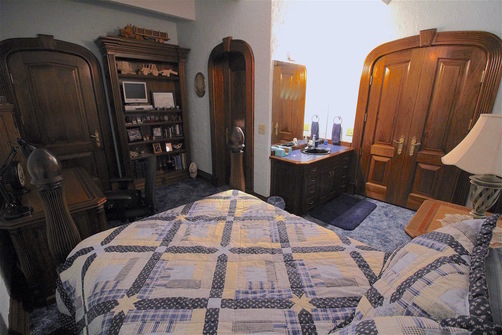 All of the doors in the home are handmade. The face into the main living area is of black walnut, with a figured bubinga (an African wood species) inlay. 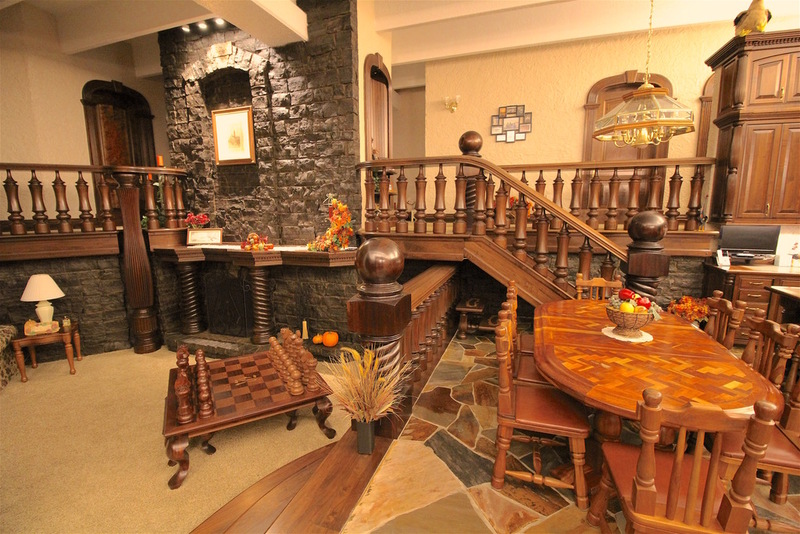 The other face is made of the same species of wood used throughout the room that it opens into. We use a special laminating and veneering process that allows us to successfully use different species of wood on the same door and not have a warping problem with the finished product. Each door weighs about 300 pounds, so commercial grade brass ball bearing hinges are used on all. These door units were completely fabricated in our shop and brought in prefinished and put into place. 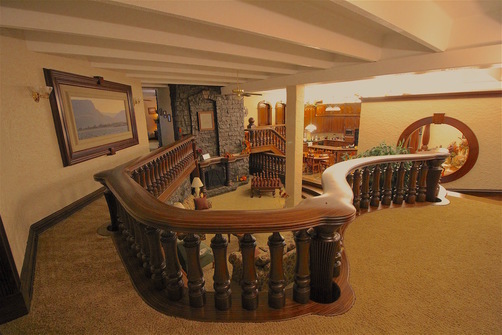 Our business specialty is sweeping, radiused, or spiral stairways. All of our stair parts are handmade in our shop, including hand railing and lathe work. This staircase would prove to be a formidable challenge. We chose to hand laminate our hand rail in the house to ensure a perfect match. After gluing a 5 inch by 12 inch bent lamination, that if stretched out, would be over 50 feet long, we “unscrewed” it out through the front door and took it to our shop to dress and profile. It was then brought back, and carefully “screwed” back into the building. 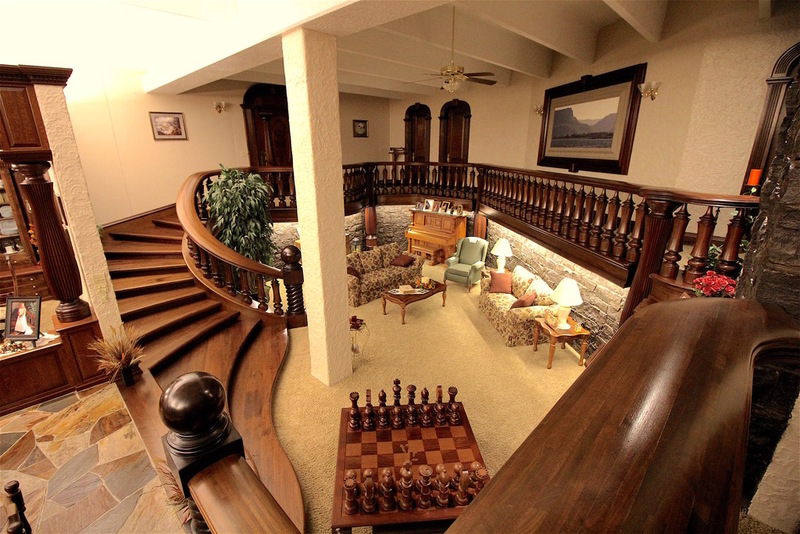 The 12 inch wide black walnut hand rail sits atop 6 inch wide African mahogany balusters. The 15 inch wide newel posts with the rope turnings, as well as the 9 foot tall intermediate corner posts are all of African padauk. 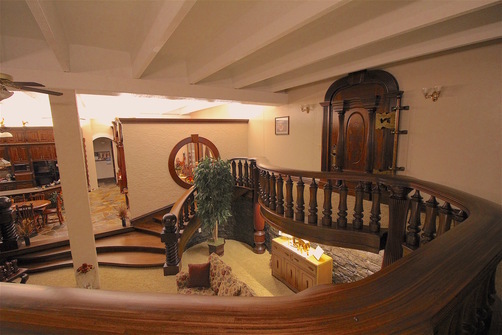 A unique feature of this stairway is that it also serves as a massive return air vent for the entire home heating and air conditioning system. The 3 inch thick stair treads do not actually touch the risers directly below them. Careful observation will reveal a 1 ¼ air space hidden along the entire length of each tread. 15 foot ceilings posed a dilemma for kitchen cabinet design. To look well balanced, we felt the cabinetry needed to be 12 feet tall. Functionally, we knew that height would result in some unusable space were it not for one very special feature—a rolling “library” type ladder, that, when not in use, folds up nicely to the side out of the way. The cabinetry is all black walnut. The countertops are a solid wood edge band with an inlaid formica top. A significant amount of indirect lighting was placed high atop the cabinetry to help light the main part of our home. The dining room is open to the main part of the house and very visible. We built everything you see here, including all of the furniture. 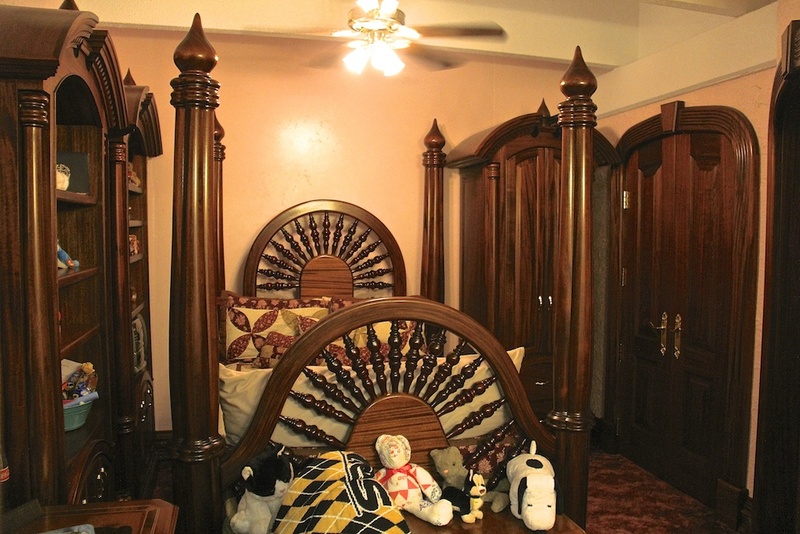 A series of columns and overhead arches, built of leopardwood, help to create the look of a somewhat separate room. The china hutches are all of black walnut. 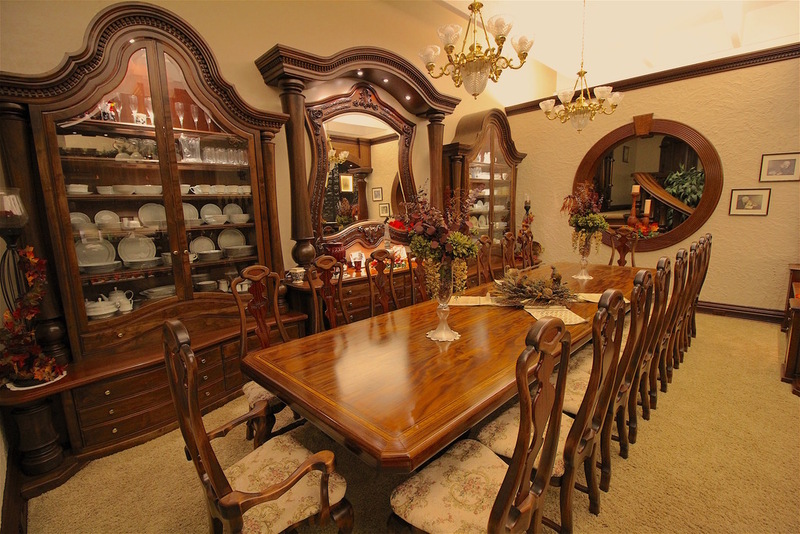 The 16 foot long, one-piece dining table is edged in African padauk. Its center is a crumpled-satin-like grained mahogany with inlaid medallions of various exotic woods. The 18 chairs that surround the table are hand made of butternut and each backrest is hand carved with a picture of something special about us. Each chair is entirely different and uniquely ours! 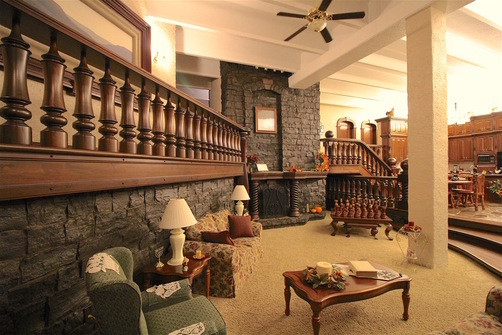 The living room is a comfortably large open room with18 foot tall ceilings. A black limestone fireplace fills in one end of the room with matching black limestone walls under all of the balcony railings. Still a work in progress, all it lacks is a small limestone fireplace on one end of the room. 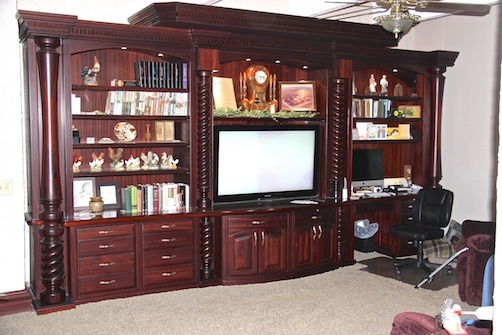 A large wall unit made of padauk incorporates TV, stereo, computer, and DVD storage. 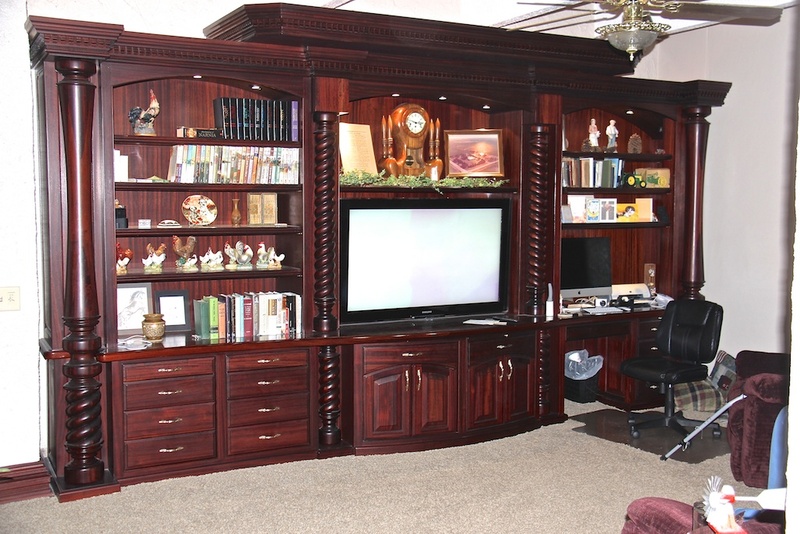 We have used a significant amount of padauk in our home because we liked its natural deep burgundy color. Because it is extremely reactive to ultra violet light, care must be taken when using this species of wood. UV exposure causes it to lose its burgundy coloration very quickly and become almost black. Our home has very little UV exposure, so we anticipate a very slow color transition. So far, we have been right. This bedroom would be considered the Master Bedroom. All of the woodwork and furniture in this room are made of leopardwood. This material was a once in a lifetime purchase. It is extremely rare and hard to find in any quantity. It is also very dense and heavy. The bed alone weighs 2,000 pounds and had to be carried in and assembled in place. All of the furnishings and woodwork in this bedroom are made of butternut. 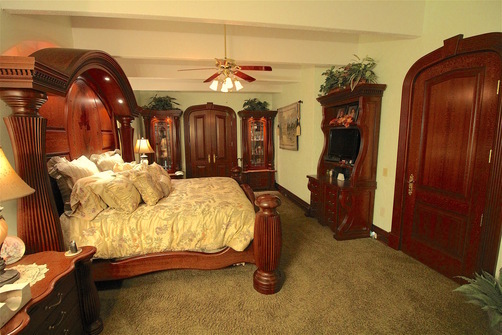 All of the furnishings and woodwork in this bedroom are made of African mahogany. 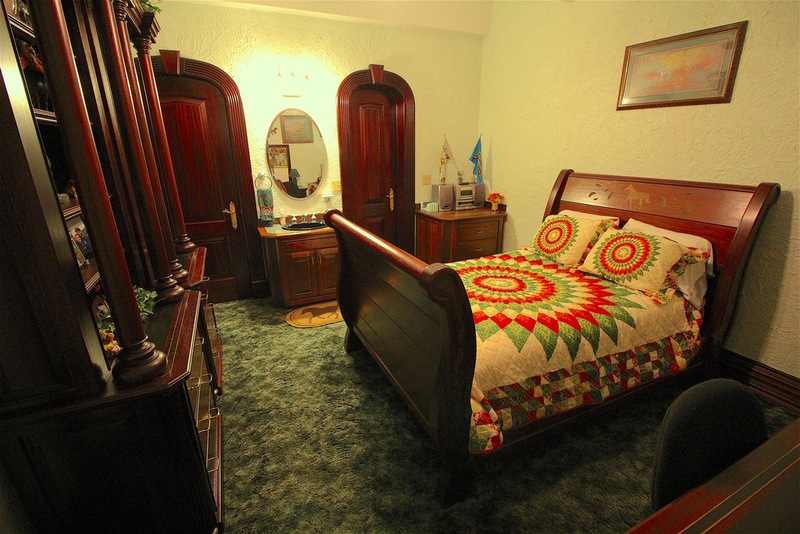 All of the furnishings and woodwork in this bedroom are made of African padauk. Yes, we do have a secret door and passage. This was just for fun, but a lot of hard work to design and get to function perfectly. It is actually a door to a mechanical passageway and room where we have multiple pipes and conduits running along the surface of the walls. This area was designed for maintenance and access to key systems, in case anything breaks down or needs repair in the future.